For the developers behind LocalEats, it’s a case of today the iPad, tomorrow the world. LocalEats.com has taken its restaurant finding app for the iPhone and iPod touch and created a new version for the iPad. But LocalEats for iPad is no simple port of the iPhone application. For its iPad release, LocalEats is expanding its scope beyond restaurants in major U.S. cities to include listings for 50 cities around the globe. The app is designed to appeal to globetrotters who find themselves anywhere from Amsterdam to Zurich and who want to find a good place to grab a meal. As with the iPhone version, the focus for LocalEats for iPad is on curated listings, not comprehensive ones. Rather than list every eatery in a given city, the app limits its selections to top restaurants—the ones where locals are likely to eat and recommend. That means few chain restaurants make the grade—certainly none of the TGI-McAppleChillis that dot the culinary landscape these days. To take advantage of the iPad’s larger screen, the new version of LocalEats features a panoramic picture on each city’s main page. 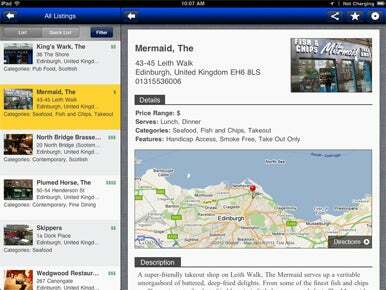 Restaurant listings include a zoomable map for finding directions to a particular eatery. You can filter listings by neighborhood, category, and price range. And U.S. restaurant listings include integration with the OpenTable reservation service. As for international listings, LocalEats includes a tips page with data on a city’s notable eats, tipping etiquette, and other traveler-friendly information. Both international and U.S. listings including links to Wikipedia entries about a city as well as local weather. The iPad version of LocalEats is a free download, though LocalEats.com plans to eventually charge for it. For now, anyone with an iPad running iOS 3.2 or later can grab it from the App Store. LocalEats users on the iPhone needn’t feel left out in the cold. The developer plans to eventually upgrade its $1 iPhone and iPod touch app to include the international listings alongside the 51 U.S. cities it currently features.